The machine is a K.O. 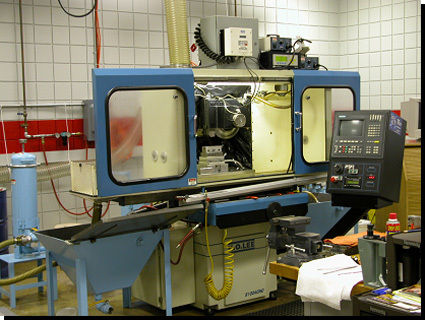 Lee 1024, CNC, surface grinder with a 7.5kW (10hp) spindle, rated from 600 RPM to 7200 RPM, providing a wheel speed range of 9.5m/s to 115m/s (1,885 to 22,620 sfm) for a 300mm (12") diameter grinding wheel. We also have modified flanges to accommodate 150mm (6") diameter grinding wheels. The wheel may be balanced, on the machine, to less than 0.00025mm (0.00001") amplitude. Fluids, either water-based or straight oils, may be supplied at a maximum of 0.76 l/s (12 US gpm) at low pressure 10.3 bar (150psi) or high pressure 138 bar (2000 psi.) The system holds approximately 190 liters (50 US gallons) of fluid, filtered by 20/20 or 20/10 micron absolute, staged drum filters. 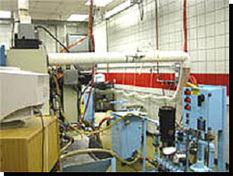 The special design of the system allows for a quick changeover of grinding fluid, to faciltate the testing of different fluids with minimal disturbance to the process or set-up. The machine enclosure is equipped with a mist collection system that has been instrumented to measure particulate size and volumetric distribution for both water-based and straight oil fluids. Mounted directly above the wheel housing is a digital camera and high intensity light source, providing the opportunity to take photographs of the grinding wheel surface without removing it from the machine spindle. For directions to the lab'. click on the Owens logo to be taken to the college site. The lab' is housed in builiding #11 Industrial & Engineering Technologies.